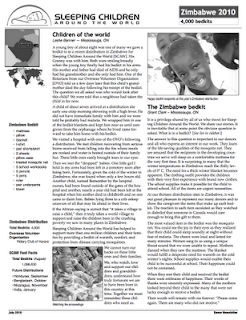 The donor newsletter for the Zimbabwe bedkit distribution has gone to print and can be downloaded from the Sleeping Children Website. Photos are available in the Zimbabwe 2010 Photo Album. You can view them by clicking the link above.